Basement leak repair company, Repel Restoration updated its basement waterproofing services to provide high-efficiency hydro-active grout injection services for homeowners in Suffolk County, Long Island and the surrounding areas. Repel Restoration, a professional basement leak repair and waterproofing company opens new location to service Holtville, Farmingville, Ronkonkoma, Patchogue and surrounding Suffolk County, Long Island, NY, cities. Their updated range of basement waterproofing services for Suffolk County homeowners is the ideal solution to repair and staop basement water infiltration and prevent future foundation leaks caused by groundwater and hydrostatic pressure. From crack repair to custom waterproofing system installation, the company helps homeowners benefit from reliable services undertaken by licensed and certified professionals adhering to the latest standards of safety and quality. 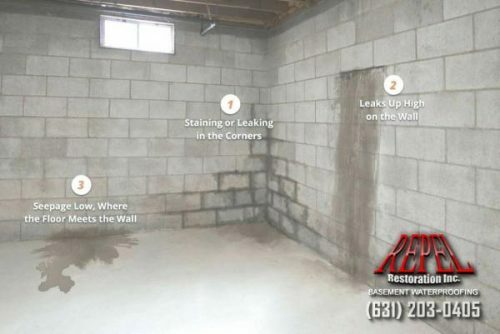 More information can be found at http://www.repelrestoration.com/Basement-Waterproofing-Long-Island. Basement leaks after heavy rains and recurring cracks are common problems for many Suffolk homeowners. While sealing the cracks with cement might be a temporary solution, working with a basement leak repair and waterproofing expert is essential for long-term water leak prevention. Foundation openings can be sealed from the interior using epoxies, which are strong adhesives, or urethanes can be pressure injected into the openings, thus penetrating the foundation through to the exterior and cutting off the path of the water and foundation leak. Repel Restoration uses hydro-active grout injections to efficiently seal the cover and stop water from leaking into the basement. The solution is based on an expandable polyurethane epoxy resin which bonds to both sides of the crack, thus forming a long-term barrier against water and moisture. The special properties of hydro-active grout makes it an efficient way to stop all water infiltrations even if the leak is active at the time of the repair, the substance bonding well with both wet and dry concrete. “Many companies will actually allow the water to enter your building or home and have a drainage system to collect the water and pump it out. But, really. I mean who wants water draining into their house?”, say Mike Muller, owner of Repel Restoration. It’s a fact that interior water drainage is not technically waterproofing. It is actually technique in mitigating basement water and is wrongfully referred to as a basement waterproofing solution. Many common systems for draining water after it has penetrated a basement involves creating a channel around the perimeter of the basement alongside foundation footers. many companies promote and install French Drain systems, a PVC pipe drainage system that is installed in the newly-made channel. The installed drain is covered with new cement. “The French drainage system collects water AFTER it has entered the basement and drains it to an internal sump pump. The pump then pumps the water out of the basement. However, such systems are labor intensive as the basement concrete is removed and the drain gets dug into the ground below. It creates a huge mess and is approximately three times more costly then the injection process.”, says, Muller. Repel, one of Suffolk County’s leading basement leak repair and waterproofing company offers personalized solutions adapted to the specific needs, budgets and preferences of each client. The recent service update is part of the company’s efforts to provide cutting-edge solutions for homeowners in Holtville, Farmingville, Ronkonkoma, Patchogue and surrounding Suffolk County, Long Island, NY, areas.